With the club now short of having two Euros to rub together, Parma have begun selling off the contents of their trophy cabinet in a desperate attempt to raise funds. 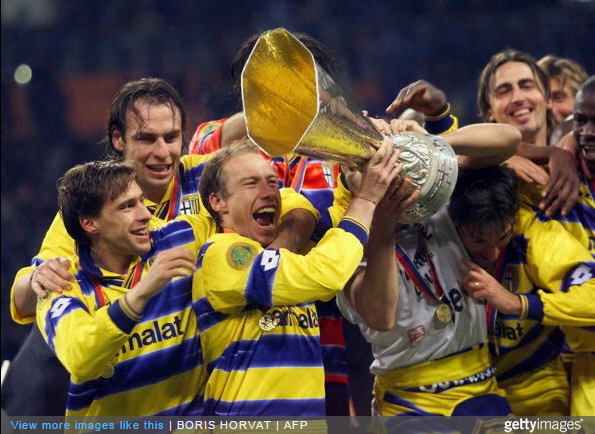 Indeed, Parma have put eight trophies up for sale including their 1995 and 1999 UEFA Cups as they struggle to clear their spiralling €200million debt. Also up for grabs are three Coppa Italias (1992, 1999 and 2002), the Cup Winners’ Cup (1993), the European Super Cup (1994) and the Italian Super Cup (1999). This coming after the club have already been forced to flog their dressing room benches to raise a little quick cash. Times is tough. Due to their crippling financial plight, the Gialloblu have effectively been liquidated and relegated down to Serie D, where they have reformed as Parma Calcio 1913. Banter, it really is the best medicine. can someone please explain the joke? why is it great news for wenger? @cremator: It’s the old “Arsenal haven’t won any trophies” bit. Timeless stuff.